Welcome the Thanos Car. For some it's just a purple truck but to the rest of the internet this purple Toyota truck is fast becoming a phenomenon with over 6,500 points (100% upvoted) and 125 comments in less than three weeks. The following year, on September 7th, 2017, Redditor SickZX6R reposted the photograph in the /r/Shitty_Car_Mods subreddit. Within one year, the post received more than 14,000 points (95% upvoted) and 640 comments. Two months later, on November 7th, 2017, Redditor t_a_6847646847646476 posted another image of the truck in /r/Shitty_Car_Mods subreddit. The thread was titled "This pic of Sean The Renovator's truck was posted to one of my Facebook groups. Looks like it's in its final form now…". This image (shown below) shows a much higher quality perspective of the truck. The post recieved more than 61 points (95% upvoted) and 13 comments. On July 12th, 2018, Redditor chestnut_mcgee posted the image in the /r/ThanosDidNothingWrong subreddit. 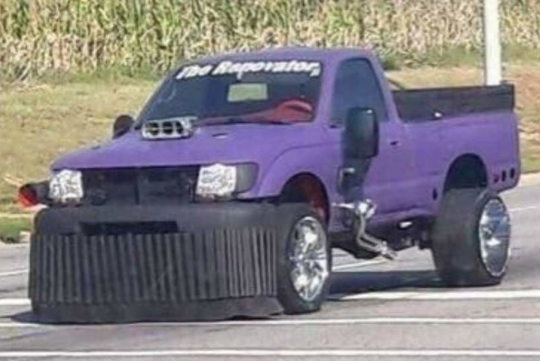 They titled the thread "Literally just a truck that looks like Thanos" (comparison to Thanos, below). The post received more than 980 points (98% upvoted) and 20 comments. On August 25th, Redditor caw_blade posted an image of the car with the caption "THANOS CAR THANOS CAR" in the /r/okbuddyretard subreddit. The post (shown below), which has been read as a sarcastic post about the reaction to the car, received more than 6,500 points (100% upvoted) and 125 comments in less than three weeks. Let us know your thoughts. 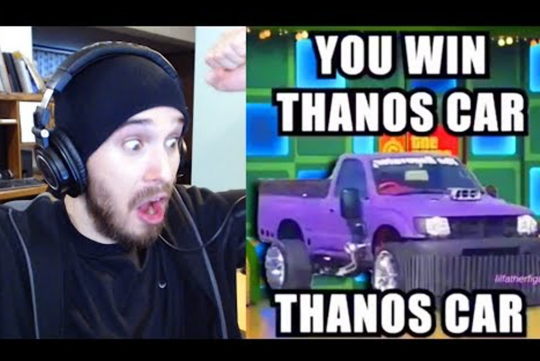 Is this the best representation of the Thanos car yet or what?